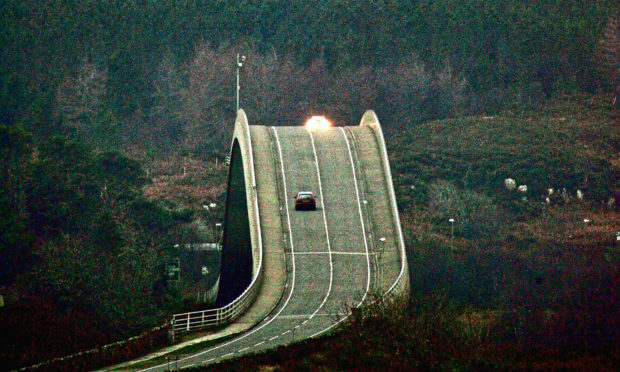 The Skye Bridge spans the gap between the Scottish island and the mainland. Ever since its construction the bridge has inspired controversy. Alex believes the SNP is missing an opportunity to reimagine our roads. Roads are political in Scotland. Whether it is Johnson telling us the only good road is the one to England, or General Wade building roads to supply garrisons to suppress us, the road is a symbol of our status. There are the famine roads, built to occupy starving peasants. And the heroic roads – Calum’s road on Raasay, hand-built against the authorities’ wishes. The bridge to Skye was an experiment in new financing – and ultimately cost us multiples of its real value, while the new Aberdeen ring road was long delayed by arguments about the environment. Most political of all roads though is the single track. A string of tarmac that no one thought worth widening, because so few came that way. The single track leads us into the heart of north Scotland’s great economic crisis. It is the oatmeal road, engineering proof of the deliberate attempt to prevent the development of the Highlands for its people. You only need tiny tracks when you know the communities cannot grow, and you know that because they don’t have the land. We have veins supplying our huge geographic body, because the economic lifeblood is so weak. Why bother with arteries, when no one can build a life. Only in Scotland is the road designed to limit opportunities. That is because of our ridiculous land ownership. Our huge land mass is in the hands of a few billionaires and environmental charities. The Scottish Land Commission has said the obvious in its report this week, but should be applauded for doing so. It says the big estates are monopolies, which harm economic growth, community building and democratic accountability. None of this is new, but it might just be a sign that the long argument over land is finally seeping into establishment thinking. The old Scottish Office legislated to allow community buy-outs, the Labour-Liberal Democrat coalition extended this and the SNP also passed land reform legislation. The last act felt more like a political obligation, a grudging concession to the Highland vote, than a considered attempt to fix the problem. This is a huge miss for the nationalists. Their big problem is how to expand the economy so that the country can afford the social provision it wants. At least part of the answer lies in the empty desert of the Highlands. Developing unused land is at the heart of western capitalism. From the Dutch inventing free market land development when they reclaimed land from the sea, funded by merchants, to the importance of real estate to the American economy, land is money made, and money kept. And this is also vital to modern democracy. Even as we lose our political loyalties, we are committed to the wider community by virtue of the land we own beneath our feet, or the desire to buy. Yet this most basic of economic and political processes is strangled in Scotland because people can’t own their homeland, can’t afford to expand, and couldn’t grow businesses because the road infrastructure is designed to stop growth. And so the real questions is why haven’t the SNP done more? Tell them there is an oil well around the corner and they will be there with a drill quicker than you can say “Norway”. Suggest there is a multinational wanting to open a factory, they will have the wallet out in no time. Say that an existing asset like Prestwick Airport is about to close, and they’ll buy it for the state and run it for pleasure (and great loss). But suggest that the SNP actively challenge assumptions about Scotland and you get this strange silence, the shuffling of ministerial feet. It is completely within our existing powers, and our wit, to reimagine a Scotland where the population of the Highlands is restored to historic highs. That is made possible by properly investing in transport infrastructure – and connecting all that new wind-generated electricity to the vehicles we travel in. Then have a plan – as you break up the estates, do so mindful of the land development mistakes of Ireland or Spain, where too much was built in the wrong places. In truth, we already have all the necessary checks and balances in the planning system. Then let democracy, community and economic freedom do its thing – just as in the central belt. Land plus people equals opportunity. For so long as this is restricted, it is little wonder so many Scots take Johnson’s advice.